The painting in question is a work by the Valencian artist Joaquín Sorolla y Bastida, painted between 1895 and 1900. It is positioned perfectly, on a partial wall on its own, affording some privacy for the viewer. 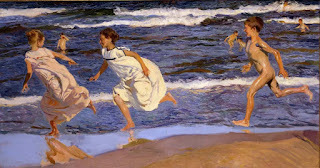 It belongs in the Museo Sorolla in Madrid and this is possibly its first visit to London. You must seek it out and see if this painting, among 57 other works – sea- and landscapes, portraits and scenes from Spanish life sacred and secular – has any effect on you. A clue: the infant in the picture is one of the grown-up children in the painting shown below.